MaestroShield’s Elements screens provide energy efficient sun shading, shelter from insects, climate control capability and rain and wind reduction. The ingenuity of our screens is highly sought after and has pleased even the most discerning homeowners with its beauty, multiple applications and ease of installation. 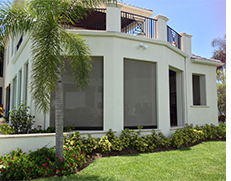 Whether increasing the value of your home, extending the use of outside areas or providing enhanced comfort, MaestroShield’s Elements exterior screens are an important addition to realizing your exterior screening vision. All exterior screens are made with reinforced corners for added strength. 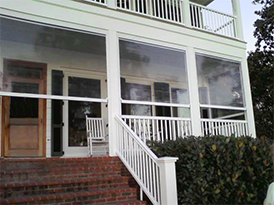 No visible screws in the side rails or bottom bar; provide a clean and elegant appearance. Heavy duty idler system allows for smooth and quiet operation. Spring-loaded idler allows for simple installation of motor tube assembly, and for removal of assembly quick and easy if necessary.